I'm wrapping up 2 weeks of school with the older boys ~ we took a week off when baby was born. The first week we got in 4 days and this past week we got in 6 days. (We school 175 days in our district. It seems to be going slow, so we are aiming to get in at least 5 days a week during the rest of the winter months). Luke did school with the youngest two while he was home taking care of me right after baby was born. Eliana looked too cute in her curls (I had it up in a twisty bun the day before) and I just love the look of determination on her face. Before baby came, we rowed "Stopping By Woods on a Snowy Evening," by Robert Frost and I hope to post that soon. Read-Aloud: Sir Dalton and the Shadow Heart (The Knights of Arrethtrae) (Luke is reading this series to the boys). This is a unique project that brings a farm frozen in time back to life as it would have been in the 1880's. A team of archaeologists and historian, with the help of experts, live as Victorian farmers for a full calender year. 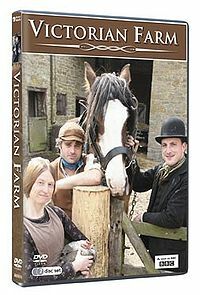 They wear period clothes, eat period food, raise period animals on a working farm using only the techniques of the Victorian era in this 6 hour-long series. Very neat! This time they live as Edwardian farmers as they would have in the early 1900's (1901-1915). We had to fast forward through a couple of scenes, but overall this was an excellent series ~ both educational and entertaining! I highly recommend them! General Science: finished Module 13 Digestive Tract, started Module 14: The Circulatory System (he really needs to pick up the speed so we can finish this book. I wanted him to start the next one this month). Unit 5: The Cardiovascular and Immune Systems cont. 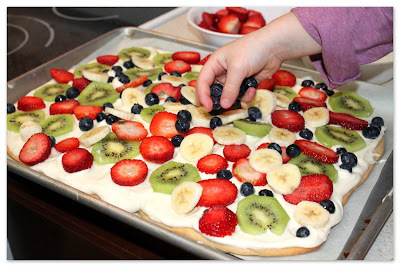 We combined the Immune System Power Recipe with the Honey Cream Cheese Frosting from the additional recipes section to make a Fruit Pizza for our Sabbath treat. We are trying to eat sugar only once a week ~ very timely that our next chapter is Carbohydrates and Sugar. :-/ I am having a hard time with sugar. The three older boys finished their dodgeball season early this week. Nathan and Dylan's team won the championship and these spiffy t-shirts. Nathan and Dylan started volleyball this week, too. The season will go for 4 weeks, 2 games a week. I am so thankful that we live so close to the Y! The boys can go to practice and games on their own. Jordan will be helping with set-up. He is also shoveling snow for the maintenance department and managing to squeeze in a few hours of work. Chess begins at the end of this month, so the boys are warming up. Visual Latin: This is an interactive video and worksheet curriculum. We have completed 3 lessons so far (older boys). I have a Tropical Traditions Organic Virgin Palm Oil giveaway going on ~ please enter if you get a chance! Hope you are off to a great start this week! Looks like a great couple of weeks. I adore the pictures of your young ones working with their Dad. So cute. You are such a super mom =) You always surprise and exhort me! Thanks for the video suggestions, I will have to look into those. Great couple of weeks. Thank you for linking up, always an encouragement to me. Praying you have a delightful week, my friend. Lots of love... thank you for your prayers! Ok, I'm loving your blog! Also got tickled that ya'll try to eat sugar only once a week as well. Our friends think we are crazy!! Chel - I love your week....and WE are loving Victorian Farm. Thanks for recommendation! Very cool. Love the look on Eliana's face - so cute! The fruit pizza looks amazing! Thanks for the comment on my blog :) Yes Andy googled the problem we were having with the camera and he took the camera apart turned the gears greased it up and it's been working wonderfully ever since! Michelle, I am honestly amazed that you got back to school so soon after Bo! Even if Luke did help, still, this is a huge accomplishment! Eliana's little curly pigtails are adorable!! She is such a pretty girl. I love pictures of your kids working at your school table together. The Victorian farm movies look awesome--thank you for sharing them. Your fruit pizza looks so yummy, and congrats to your boys' team as well!! A truly great week. I always enjoy reading what you do in school and at home. Your family is a huge example to me! i’ve been taking the store-bought kind online (e.g. http://www.geocities.jp/hongkong_bird_nest/index_e.htm of famous branded only of course) which is directly mailed from Hong Kong. this would be at a more affordable price. Update Your Reader and Blog List! Please!